And so begins my love affair with Burrata. The what? Burrata is Italian cheese made out of water buffalo or cow’s milk. Think of it as a sphere that holds a creamy, soft, decadent cheese inside that is encased in a fresh, stretched mozzarella. Apart from calling it burrata, I prefer to refer to it as Angel Pillows. I imagine angels resting their heads on burrata as they fall asleep. The other day I went to DeLaurenti and Pike Place Market to pick up a few must-have items. 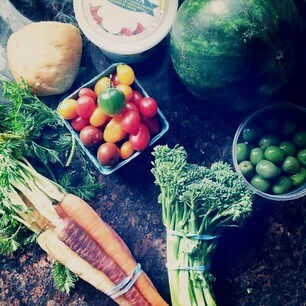 In my bag, I collected burrata, broccolini, tomatoes, olive roll, watermelon, rainbow olives, and Castelvetrano olives. 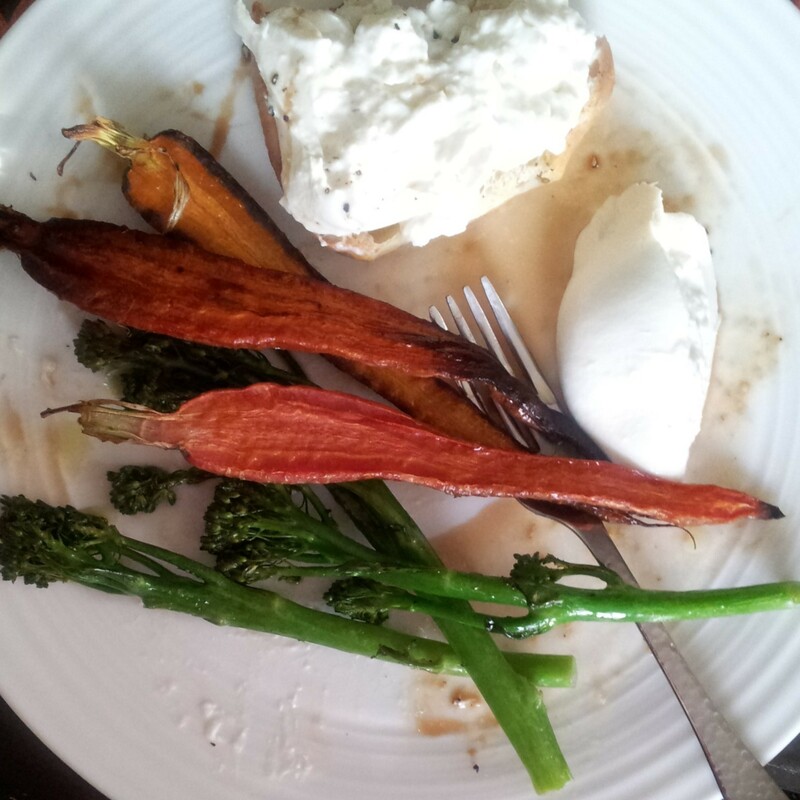 The fist night, I roasted broccolini and carrots (simply drizzled with olive oil and seasoned with salt and ground black pepper, broccolini got a healthy sprinkle of garlic). Give this a try in a 425 F for 15 minutes. 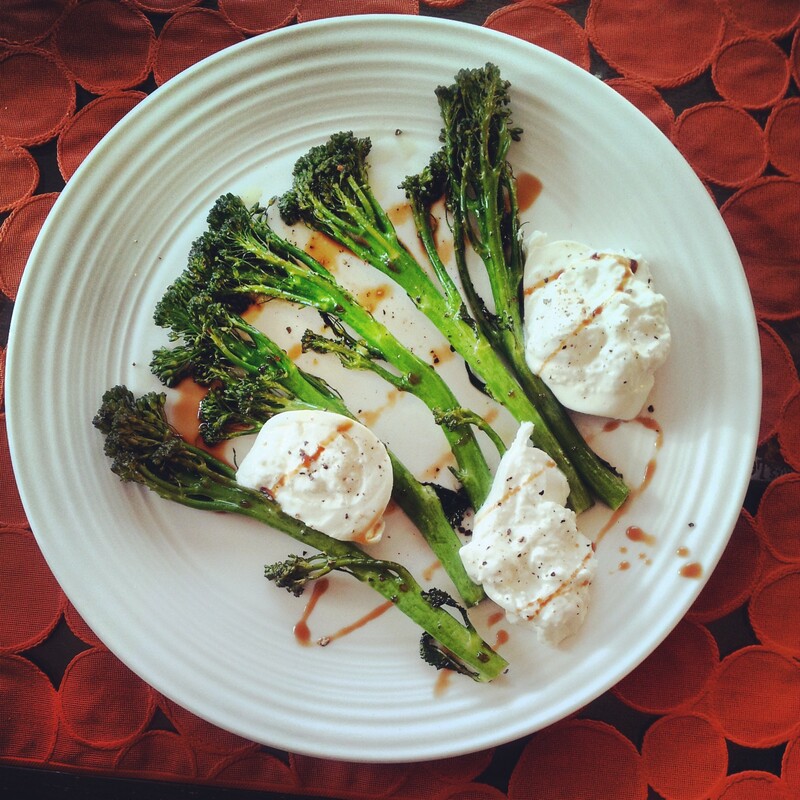 I drizzled the broccolini with pomegranate molasses and added a few slices of burrata. Once the plate was composed and photographed, I quickly moved burrata to a toasted olive bread and cheered my success with a glass of white wine. Two days later, I could hardly wait until breakfast. The whole grain slice of bread was already getting warm and crisp in the toaster. The tomatoes were sliced and lightly salted. The olives scattered on the plate. Then it came time to delicately slice a ball of burrata cheese. Be gently, you don’t want the creamy filling to ooze out. 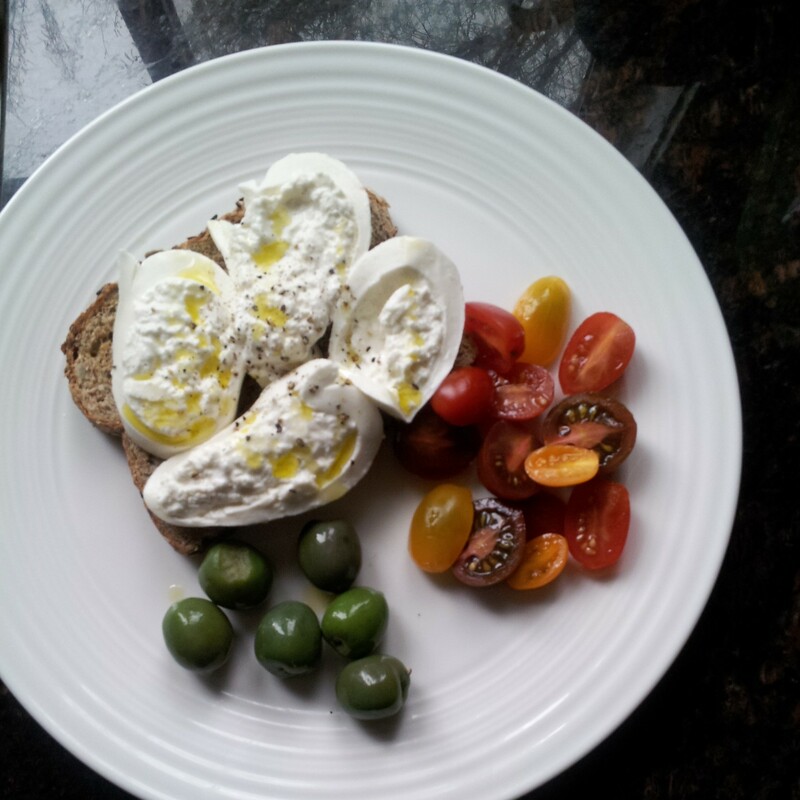 Once out of a toaster, I quickly topped the bread with slices of burrata and a drizzle of olive oil. And then I inhaled and took a bite. And just for fun, here’s a shot of what some of my plates really look like, when they are not photographed.